The Glenn Buffalo is a hometown, faith-based senior community for adults 55 and over located in the heart of Buffalo, Minnesota. Whatever your spiritual beliefs happen to be, The Glenn Buffalo – a Catholic community – delivers a commitment to both physical and spiritual health. Our Mission is to be a place where people of all faiths enjoy the fullness of life in a loving, compassionate, and comfortable environment. The Glenn Buffalo offers easy to understand pricing, many choices of floor plans, and levels of assistance. There is something for everyone here at The Glenn Buffalo. 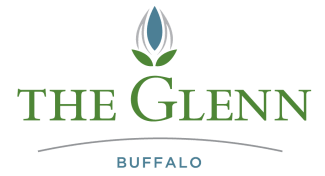 If you are searching for senior living at its very best, look no further than The Glenn Buffalo. The Glenn Catholic Senior Communities, Inc. (formerly St. Therese Southwest, Inc.) began providing exceptional service to the senior community in 1988. The Glenn Hopkins started with one independent living building set on the original Feltl farm at 1011 Feltl Court, a building now known as The Towers. Under the direction of a dedicated Board of Directors in 2003, The Glenn Hopkins opened a new addition now known as the Terraces, that includes assisted living, memory care, and an adult day program. In 2011, The Glenn Minnetonka campus opened, offering amenities and services that create a vibrant retirement lifestyle. Located in the historic Glen Lake area of Minnetonka, a time-honored suburban community between Highway 7 and Excelsior Boulevard just west of Interstate 494, the area features the conveniences of an established neighborhood with small-town charm and easy access to major highways. Out the back door, just steps away, is a grocery store, coffee shop, and restaurants. The Glenn Minnetonka features independent living, assisted living, memory care, and enhanced care suites. With the founding principles of a belief in the dignity and value of each individual and the understanding that every senior desires to live in a welcoming, vibrant, and supportive community, The Glenn Buffalo – our latest addition to The Glenn Catholic Senior Communities – offers a senior community that is not just a place to stay, but a place to LIVE. Established as Catholic communities, The Glenn Buffalo, The Glenn Minnetonka, and The Glenn Hopkins continue to celebrate this heritage as we welcome people of all faiths to enjoy the fullness of life in a loving, compassionate, and comfortable environment. A dedicated pastoral care team, supplemented by pastors from within the local faith community, leads spiritual and personal growth activities to all denominations. Our chapels offer residents a place for daily worship, communion, and quiet reflection.